Today technology has taken over and I must admit that I am right in there enjoying it every step of the way. As much as I love to be able to have information at the tip of my fingers, especially when it comes to this genealogy research, I realize that we have lost almost as much as well have gained. One of those losses is the written letter. When we didn't have cell phones to stay connected to our family and friends as frequently as we do now we wrote letters and made long distance phone calls less frequently. I do miss the letter writing and yes I still do write letters to my family and friends. The only difference now is that I type them on the computer as oppose to longhand and I must admit that typing them is my preference. Yes I still buy stationary and blank cards. There is something to be said of words written from the heart. I enjoy writing letters, but I remember when I would get tired of writing and the penmanship would get worse and worse and it would be harder for the reader, so typing my letters became the norm even before computers were easily accessible, there was the typewriter and then the word processor. I remember when I would anticipate replies to letters that I have written to my friends after college. We wrote to each other for years and I still have all of those letters. Even in all the downsizing of stuff, those letters are nothing I will ever part with. As I continue in this genealogy research I discovered that the letters that many of my relatives wrote many years ago tell you more about who they were than any census data can. The other beauty is more often than not they wrote just the way they talked. I have had the privilege of reading some of these letters or hear some letters read to me from my great grandmother Ella to her sister Julia and they are so funny. The way they wrote and the way they spelled out the words is what strikes me as funny, but you can hear the love and compassion in them just the same. So what is it that we will leave for our descendents to really know who we were? I do encourage you to write more letters, even snail mail is not as slow as it use to be. I know what you are thinking. Who has time to write letters? I say make the time. I use to fill my days up with lots of activities at one time myself, but the need to do that has long passed. I do enjoy my quiet time. The time I sit down to read old letters or to write new ones. That moment will feel better than you know until you do it. So take the time and see what I am talking about. We don't even tell the family stories to our children like they did many years ago. How will our great grandchildren know what was important to us? How will they know our worries and concerns? I guess the millions of blogs that are presently online will be something that our descendants will research and yes they will give them some insight, but will they still be around. I get the feeling that they will be destroyed to make room for more, or something that is bigger and better. This I do often wonder about, hopefully they will be archived somewhere for retrieval in the future. I have been working on this genealogy for a number of years now, but I have it all on the ancestry.com website and I don't have a hard copy of it. Yes I have saved various documents but not all of the information, stories, and photos. Well the Family Tree Maker 2012 is going to rectify all of that. I had a previous version of this software, but this particular version has a sync feature where you can sync the software with the online ancestry.com and save the information in two formats; GEDCOM AND FTM. Only the FTM format will include all the text as well as the media, but you must have a version of the Family Tree Maker software to open it. I am excited about all of this because if anything happens to me, there will be an exact copy for my family to access. Right now I don't have any idea who in my family will pick up where I left off, but hopefully by that time there will be someone that is just as passionate about learning of their roots as I am today. I also hope that all that I have learned about my family will propel them. Right now I am concentrating on writing letter, notes, blogs, and social media as a way to leave my mark and pass on what I learn. 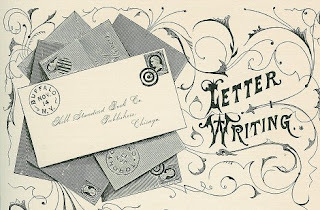 After writing this post I looked online to find an appropriate photo or animation to put her and found the one above and also found it attached to this website, that seems to be expressing the same emotional attachment to letter writing. The name of the site is The Art of Manliness, which I found even more interesting.